... the folly of a bypass in the wrong place ... ... a series of A350 bypasses, or why not now fund the existing railway ...? Organisations against the eastern Westbury bypass scheme suggest integrated transport-traffic solutions based on strategic access roads and what is in place. www.corridor-alliance.co.uk - White Horse Alliance. www.foe.co.uk - Friends of the Earth. www.cpre.org.uk - Campaign to Protect Rural England. www.bettertransport.org.uk - Campaign for Better Transport. Conservation Award for WHA's winning campaign - Romsey Advertiser. The �500 CPRE award was put into further environmental conservation work. Wiltshire Council awarded the ex-director of its failed eastern bypass project, which wasted some �5,000,000, with �67,000 'compensation for loss of office'. 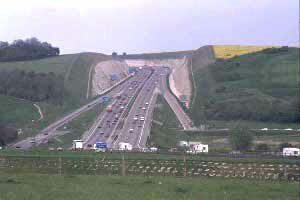 Wiltshire's Council's eastern bypass plan died after exposure to common sense. Here is a group which supported an eastern bypass around Westbury. Westbury Bypass NOW! - statement to the South West EiP [on pdf]. We might have included a link to the failed Westbury Bypass NOW! group. But the 'Bypass NOW!' website now appears to have been abandoned. www.wiltshire-council.info - ignorant Council trashes Wiltshire heritage. Here is a local website about our endangered railway services in Wiltshire. via Warminster, Westbury, Melksham & Chippenham - parallels the A350 road (which Wiltshire Council wants to build a series of bypasses along) but this existing railway (still with few trains on it) is starved of funding.